I am really excited to be trying a new product. I have just received it and I am SO looking forward to using this. I think that this gadget is so innovative and useful that I am writing about it before I can provide a full review. If you are like me you try to eat healthy, serving your family, and especially your children, a diet that consists of less processed foods and more fresh fruits and veggies. I avoid multiple trips to the grocery store - I simply do not have the time. I work full time (sometimes 60 - 70 hours per week) and cannot be going to the grocery store every 2 - 3 days. I try to make the food shopping trip every 1 - 2 weeks so tend to buy a good variety of foods in large quantities. This is great the first few days but ultimately over the course of a year I end up throwing out hundreds of dollars of food that has spoiled before we can eat it. 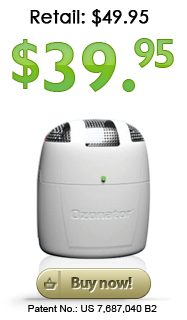 The Ozonator is a small appliance that you place in your refrigerator. It is compact, runs off batteries and can save you hundreds of dollars by preventing food from spoiling prematurely. I HATE wasting anything but especially food as it is so expensive. The Ozonator, known as the Green Refrigerator Machine™, is THE eco-friendly, time and money savings refrigerator solution for the 21st Century. Over $1000 a year in grocery savings Eliminates all odors in the refrigerator, i.e. : fish, garlic, onions, etc. Dramatically reduces potential for spreading germs Neutralizes the harmful molds and bacteria promoting a clean environment Keeps Food Fresher, Longer by delaying mold and decay of foods you buy – including fruits and vegetables – helping them to retain their freshness and flavor longer. This is an incredible gift for someone on your holiday list or better yet, buy one for yourself too! For $40 you could be saving hundreds in food costs. By extending the life of your perishable foods you can watch the money that you save expand! Even if I did not have the chance to review this, I would be seriously considering buying because I consider this an investment. Look at how small it is.! Fits right in the fridge! I have not had it long enough to completely vouch for the results so I plan to monitor this and then post about it, sharing my experience with my readers over the course of a few weeks. Guest post by Jan Helson, creator of The Global Game Changers children’s entertainment brand and author of the children’s book, The Global Game Changers. The brand was developed to inspire children to “Ignite Good!” and use their superpowers to make the world a better place. The goal is to teach kids about the many different ways they can give back and develop their philanthropic interests. The holiday season is a wonderful time to start teaching children about philanthropy and the joys of giving. The key to encouraging your child to become a life-long giver is a simple equation: Your Talent + Your Passion = Your Superpower! You don't have to be bitten by a spider to be a superhero. By encouraging each child to combine their individual talents and passions, you can make giving an integral part of their lives. 1. Discuss how important it is to give as well as to receive. Read them a book with a Christmas theme, and discuss the spirit of the holidays as seen in these books. My family used to attend yearly performances of A Christmas Carol, Charles Dickens’ classic tale of a man who learns the value of giving back. O Henry’s story of The Gift of the Magi also shows how much people who care for each other are willing to give up to make each other happy. Dr. Seuss’ Christmas classic, How the Grinch Stole Christmas is another fun way to introduce the concept of the Christmas spirit and giving. 2. Engage in giving as a family. There are an abundance of opportunities to show children how to give, and to explain to them that while Christmas might be an opportunity to receive presents, it’s also a great time to give back! There are so many wonderful opportunities to give over the Christmas holidays. Participate in a Turkey Trot or other run to benefit a charity. Stop by a local church or mall to find an Angel tree and shop for Christmas presents for a child who might otherwise not get anything. Bring your kids along when you deliver meals through programs like Meals on Wheels. Donate new or gently-used toys to programs like Toys for Tots. Arrange a Christmas carol sing-along at a local retirement home. Send Christmas letters or treats to troops stationed overseas. Drop some change in a Santa bell-ringer’s jar. 3. Cultivate their passion. Now that you’ve participated in giving, figure out what kind of giving interests your child. What’s their passion? Perhaps they would like to do something to help kids like them who are sick or in need. Perhaps they are interested in the natural world and would like to do something to help the environment. Encourage your child to think of a way that she/he can give back to a charitable initiative that they feel a connection to. Engaging your children in giving back to something they care about will make them life-long givers. 4. Unleash their talents. Expose your child to the tools necessary for them to create his/her own charity project by combining their passion for a particular cause with their strengths or interests. Is your child a baker? Then she/he can have a bake sale to raise money for a favorite charity. Perhaps she/he is crafty and can sell trinkets made. Athlete? Organize a sporting event to raise awareness for a charity they care about. My daughter Rachel is an actress. She put on a show to benefit the Susan G Komen Foundation after discovering three of her aunts had been diagnosed with breast cancer. You can show them online tools for raising money, and give examples of what other children have done to make the world a better place. 5. Embrace their individuality and re-enforce that they can make a difference. Help your children learn Ebeneezer Scrooge’s lesson: “"I will honour Christmas in my heart, and try to keep it all the year.” Now that your children know about giving, help them continue to give throughout the year! Using these tips, you can show your children how the holiday spirit can spark interest and get them moving toward making the world a better place all year round! Enter the Global Game Changers contest! Readers: “Like” the Global Game Changers Facebook page and then post a picture of your child(ren) in action “igniting good!”. Jan will choose one lucky fan to receive a gift pack complete with The Global Game Changers book, an Ignite Good! superhero cape, a 56-page Ignite Good! Activity Book and $30 Amazon gift card. • 7 Thunder-ific Tips for Kids! Does your kid dream of going pro? Use these awesome tips to help them sharpen up their skills! Bev's Beads is a site containing handmade items from artist and jewelry designer Beverly Moore. 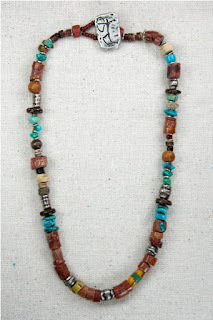 Her work is very earthy as she uses primarily African Trade Beads and natural materials / gem stones. Beverly's designs have been featured in Sports Illustrated and worn by celebrities such as Steven Tyler (Aerosmith lead singer and American Idol judge). I received a sample of "The Ruins" for review purposes and can attest that the quality is fantastic. It is really a beautiful piece - the I am a beader and have always loved trade beads. The fact that these are authentic, vintage trade bead s(1700s and 1800s) is really appealing - aesthetically, historically and environmentally. The thoughtful selection and composition of quality materials ultimately gives the wearer a piece that is artsy, funky, fun and sure to draw compliments. The clasp is also beautiful which are also made from reclaimed items. These items will vary slightly as the materials used are unique, being made from natural gemstones and reclaimed African Trade Beads. This would make a truly impressive gift for someone on your holiday list. Bev designs for both Men and Women, offering Necklaces, Bracelets and Earrings. If you want to purchase something extra special, Bev also offers collections and commissioned pieces. Also remember - if you are purchasing one of Bev's beautiful creations, you are helping support an independently owned and operated business! 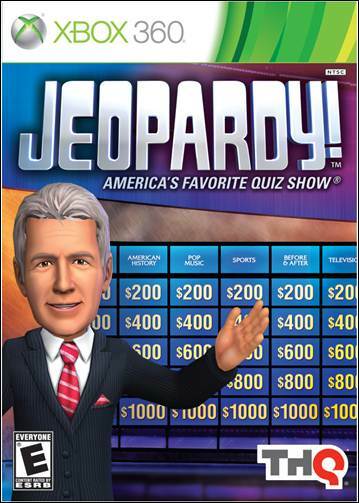 Alex Trebek and Johnny Gilbert for Jeopardy! My middle DD is obsessed with doing her nails. Every other day she is sporting a new nail design. I plan to start a nail blog for her to showcase her designs. One of her big x-mas gifts is a huge nail polish set. • Self-adjusting stand positions hands and feet at the perfect angle in stable and comfortable position. • Two removable, washable covers, made of 100% cotton terry-cloth, are included. • Polish holder leaves hands free to work quickly and comfortably without spills, accommodates a wide variety of bottle shapes and sizes, can be swiveled and tilted for easy accessibility. • Accessory tray holds everything you need – polish remover, implements and extra polish – all within easy reach. Salvador Kitti is a family-owned and operated small business with products that feature the original artwork of founder Amy Pugh-Campos. Part of their proceeds are donated to wildlife conservation centers and zoos so in addition to owning a beautiful, and usuable, piece of art, you are also helping a great cause. Their expansive library of images, taken from original oil paintings, includes over thirty different, colorful and cute images to suit many tastes! 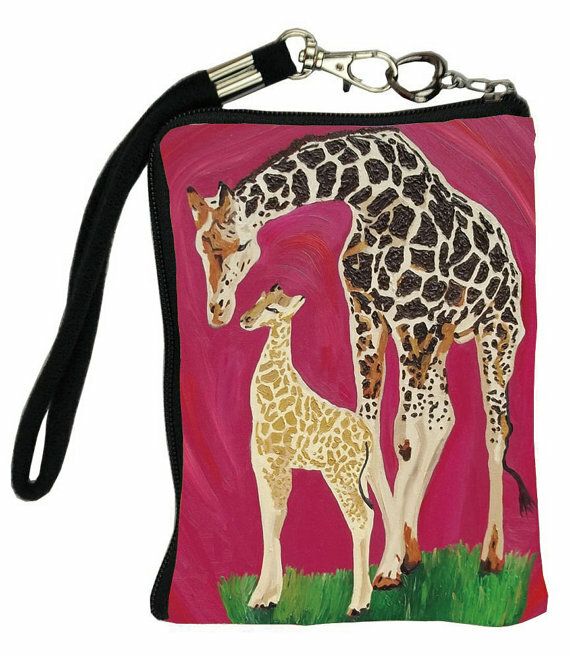 They offer great stocking-stuffers in their cosmetic bags, wristlets, keycases, change purses, and watches. Pictured to the left are the Secluded Grace Key Chain. 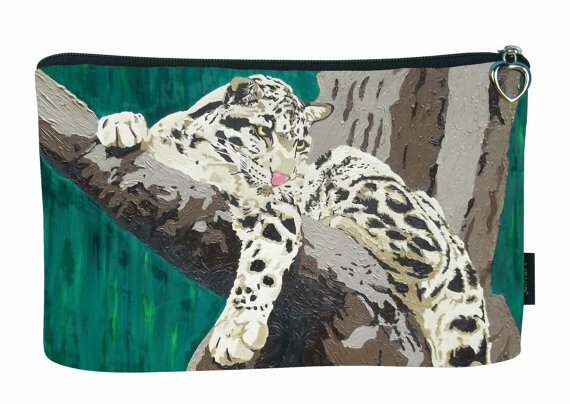 I received the Secluded Grace (clouded leopard) Wristlet for review - it is super-cute image on a silky wristlet. The key chain currently retails for $6.50 and the wristlet for $15.95. 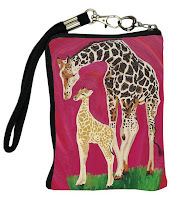 At these prices these are perfectly adorable and perfectly affordable gift for tweens/teens. Visit their homepage or Etsy shop! Love Christmas Carols. 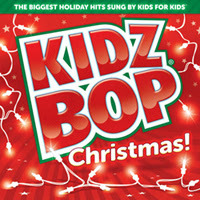 Kids do too so don't give them a cd that sounds like it was recorded 50 eyars ago - KidzBop CDs feature the same songs we know and love, but recorded by kids, for kids! Why not dress your dog up this year? Don't like pet costumes? Why not a personalized dog collar? Collars2Switch.com has dog collars with removable fabric swatches. I received a small sample - too small to use for my dog but big enough to handle and review. The collar was very sturdy and the ribbon used seemed to be heavy duty. Fabric/ribbon swatches simply attach to the collar via velcro. The site offers a wide variety of options - perfect for your favorite little furball. Thanks to Bev's Beads, THQ and KidzBob, I have a few items to giveaway - simply fill out the rafflecopter form below. Disclosure: I received products for review purposes. All opinions expressed are my own. Scribblenauts Unlimited is a side-scrolling Puzzle game with a substantial Action component, in which players use a magical in-game notepad to create objects that are used to complete tasks and challenges that are placed before them. Once created, objects are stored in the game's object library, and can be resummoned using their given name, and even altered for use later. Additional features include: the return of the series hero, Maxwell, now with a deeper storyline; an open world game design featuring themed play areas; hint functionality; and 3DS StreetPass functionality that allows created objects to be shared wirelessly with other nearby players. 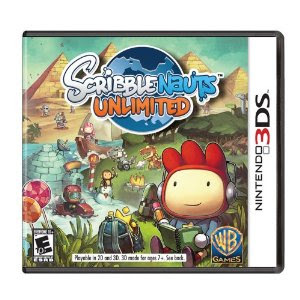 Disclosure - I was provided with a copy of the Scribblenauts Unlimited for the Nintendo DS and one reader from this blog will be selected as a winner and also receive a copy. 2 Fans will Win UnReal Candy or Your Choice of a Purina Pet Snack. This giveaway is being held by Rjays Freebies. 2 fan will win a 1 of the above prizes. This is open to U.S. residents only. 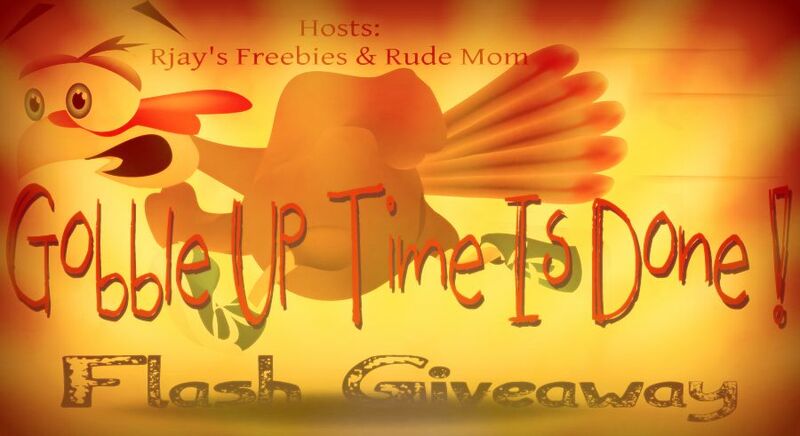 This giveaway is active 11/23-11/24. The sponsors are solely responsible for shipment. The winner must submit address on widget or will forfeit prize. 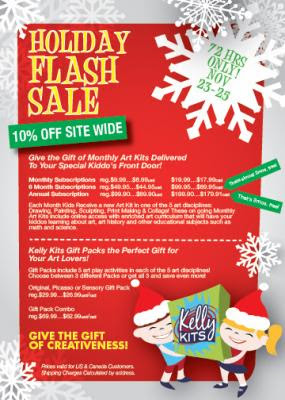 Visit http://www.kellykits.com/holiday-specials/ or click the picture below! Disclosure: I will receive a kit for review purposes. Ready for the Holidays? If not check this out! a Rafflecopter giveaway Disclosure: I received the items for this publication. I was in no way compensated for this publication. My opinions are my own and may vary from those of your own. Momanthology is not responsible for sponsor prize shipment. As part of a holiday promotion, I was able to review my shopping experience at ProFlowers. I had ordered from sister sites before, but not from ProFlowers directly. It was really difficult to decide what to purchase off of Pro-Flowers. There were so many terrific options. The selection was truly incredible - ProFlowers offers so much more than flower arrangements as you can see from my final selection! 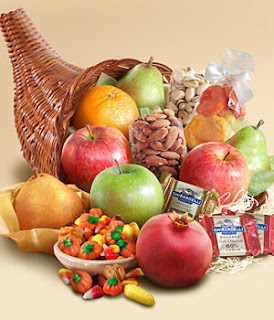 I finally settled on the Fall Cornucopia (above). I did notice that shipping was by the item (not the total purchase, so please monitor that when checking out. Otherwise ordering was SO easy -I added what I wanted to my cart and then went to check out. I simply selected the date I wanted to order (I placed my order over a month ago and scheduled it to deliver today). I then filled in my information, added my coupon code and payment information, submitted, confirmed and taa-dah! I was finished. I LOVED that you could schedule in advance. I received confirmation when the order was received, when it was being processed, when it was being delivered and when it was actually delivered! Great customer service! The basket arrived today and it is simply beautiful. Miss E. keeps begging me to open it but I told her not until tomorrow after school (see it all wrapped up below). I am counting on her asking again at least 1 -2 times in the morning though..... Such is life with children - they tend to keep asking until they hear the answer they want to. Pro Flowers also features gift ideas on the front page and offers a Deal of the Day. You can also search by occasion, type of flower, plants, gourmet gifts and/or specials! Whether you are shopping for the holidays, a birthday, another special occasion, or just because, ProFlowers is a great one stop shop to send a thoughtful gift that will make a lasting impression. Shutterfly’s exciting new greeting card brand that makes it easy for people to create and send one-of-a-kind PERSONALIZED greeting cards! Treat cards are perfect for holidays, birthdays, congrats, thank yous and any other special occasion you can think of. Thanks to Treat.com I have a code for a FREE Treat.com Card. This offer is good Monday 11/19/12 & Tuesday 11/20/12 only! If you get a chance, please come back here and post what you sent from Treat.com! With Thanksgiving fast approaching, impending need for a delicious turkey becomes paramount, as does a little downtime for the chef! Below is theabsolute best recipe out there to make the perfect, juicy turkey recipe that will keep you sane at the same time. 1. Remove the giblets from the turkey, and place into a deep, high-sided bowl on its end with the stuffing end up. Set aside. 2. Go to your PC or Mac. Log onto Big Fish Games, and download Mystery Case Files: Shadow Lake. 3. Heat the chicken broth in the microwave in a large microwave-proof container. Place mushrooms in a glass bowl and pour heated broth over them. Cover and set aside for 35 minutes. 4. In a large mixing bowl toss the onion, celery, and green pepper with the oil and salt. Place the vegetables on a sheet pan and roast for 35 minutes. 5. Take a 25 minute break to view the opening scene of Mystery Case Files: Shadow Lake. Get your first clue from the medium, played by actor Lea Thompson. 6. During the last 10 minutes of cooking, spread the cubed bread over the vegetables, return to the oven, and continue cooking. 7. Drain mushrooms, reserving 1 cup of liquid. Chop the mushrooms and place in a large microwave-proof bowl with the vegetables and bread, reserved chicken stock, cherries, pecans, eggs, sage, parsley and black pepper. Stir well in order to break up pieces of bread. Use your hands to combine, if necessary. Heat the stuffing in a microwave on high power for 6 minutes. 8. While the stuffing is heating, rub the bird with oil. Working quickly, place the stuffing into the cavity of the turkey to avoid losing heat. 9. Place the turkey into a roasting pan, on a rack, and season with salt and pepper. Place the roasting pan on the middle rack of the oven. Roast for 45 minutes. 10. While roasting, go continue playing Mystery Case Files: Shadow Lake Collector’s Edition. Make sure to set the timer for your turkey, otherwise you might lose track of time! 11. After 45 minutes, reduce the heat to 350 degrees F and cook for another 60 to 75 minutes or until the bird reaches an internal temperature of 170 degrees F.
12. Return to your computer to keep solving the mystery of the abandoned town of Shadow Lake in Mystery Case Files: Shadow Lake! After all, with all that prep work, you’ve earned a break! By following these simple steps, not only will you present a delicious stuffed turkey to your family, but your sanity will be preserved, because you were able to escape the pressures of the day and play a fabulous, brand new Mystery Case Files game. And in true Thanksgiving spirit, you could even involve the whole family, and work together to solve the puzzles! Your skills as the Master Detective are needed once again! This time, a psychic medium has reached out to you to solve the mysterious destruction of a town on the edge of Shadow Lake. Armed with strange ghost pictures she drew while in a trance, you must canvass the town’s landscape, unlocking visions of cursed objects, and unexplained accidents. 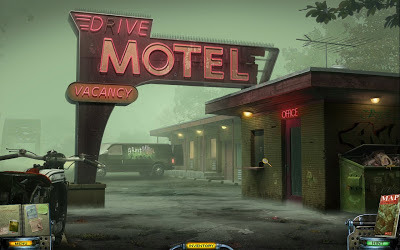 · Expanded Hidden Object Scenes – Our favorite puzzle is back, but with a twist! 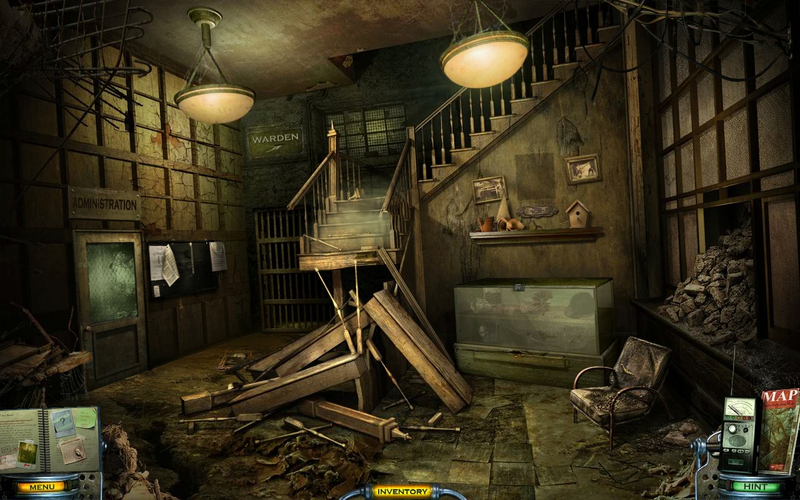 Now, instead of looking in just one room in a stack of items for your hidden objects, the hunt spans several rooms. · Map Travel – With so many different locations to visit, we’ve included an animated 3D rendered map that will allow you to travel between different places in the town quickly. But you’ll still have lots of scenes within each location to navigate! · Exclusive Features – Our Collector’s Editions include several additional features, like bonus game play, morphing objects, achievements, and exclusive production materials. · Built-in Strategy Guide – Get stuck somewhere? Not to worry! Collector’s Editions come with a guide right in game to help with the trickiest puzzles! Recognize this lady? Think Back to the Future, Caroline in The City and Switched at Birth. Hello Lea Thompson! Film, TV and now Video Game star! A little Messy. A little Scary.... Think you can navigate through it? Interested? To be released this week..... I cannot wait to download and try it! I have 4 Mystery Case Files games and love them all. I have never been disappointed. Thanks to Big Fish Games I have download codes to give to two readers who are registered at Big Fish Games. (If not, simply register) This is a short giveaway so the winner can play over the holiday weekend :) To enter simply fill out the rafflecopter form below. 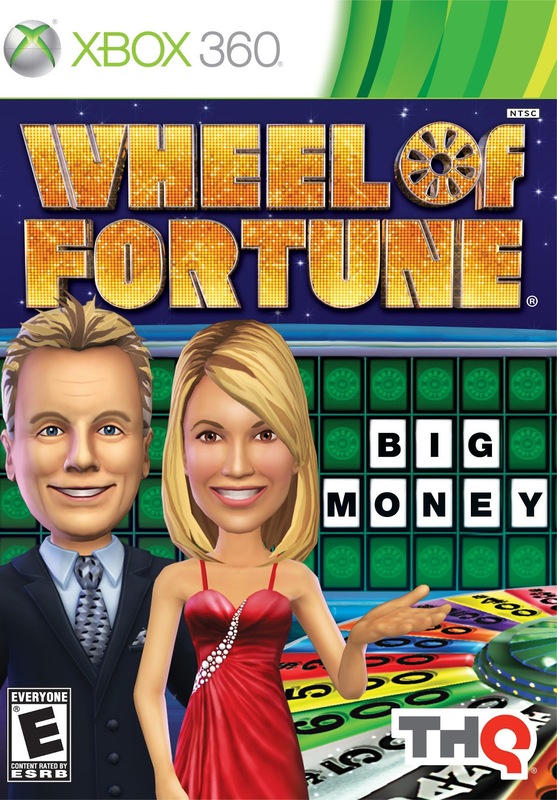 Disclosure - I received a game code to Big Fish Games to thank me for sharing this information with my readers.